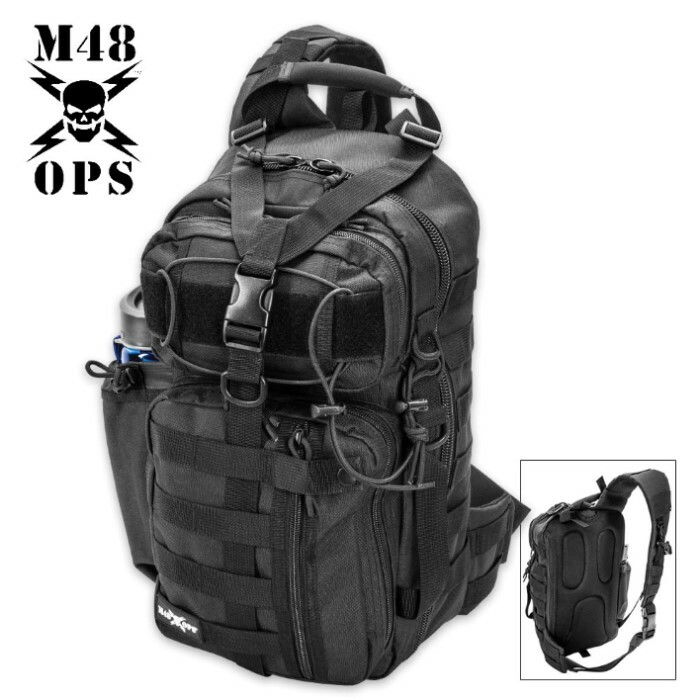 M48 OPS Triggerman Sling Bag | BUDK.com - Knives & Swords At The Lowest Prices! Dimensions: 17"x 11 1/2"x8 1/2"
You absolutely won’t believe the amount of space in our M48 OPS Triggerman Sling Bag and its capacity to organize essential gear you need whether you are traveling, working, camping, hiking or even bugging-out! It is constructed of water resistant Black 600D Oxford polyester and features a padded shoulder strap and durable integral carry handle. A thick padded nylon back panel gives you comfortable carry and back support while the lockable buckle and heavy-duty zippers make the pack completely secure but quickly accessible. The PVC lined main compartment provides space for overnight travel essentials and includes two pockets and two zippered mesh pockets, plus, a large pocket with Velcro lining. The two zippered front pockets give you even more space for your various travel essentials and both have rows of MOLLE webbing. The bottom pocket is actually two pockets in one with the smaller pocket having a vertical zipper, protected by a snap closure. 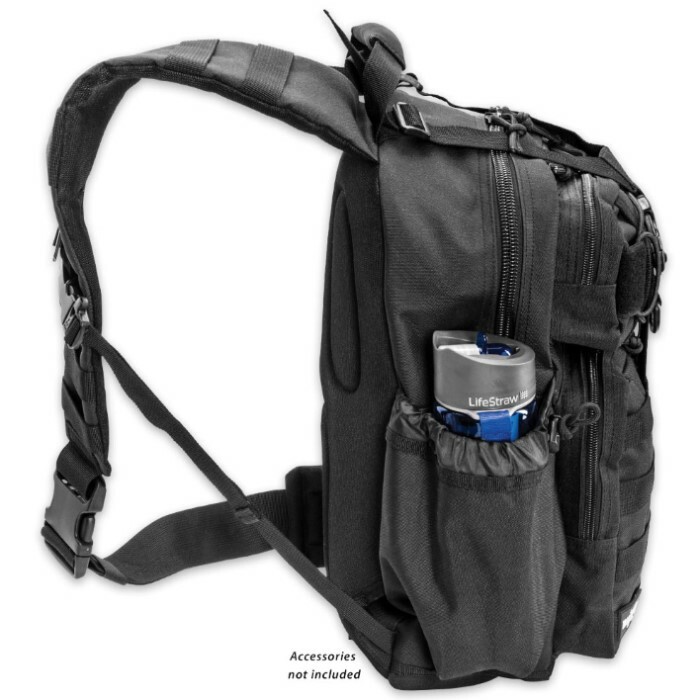 The larger pocket features a plastic clip for a keychain attachment and an inner pocket. 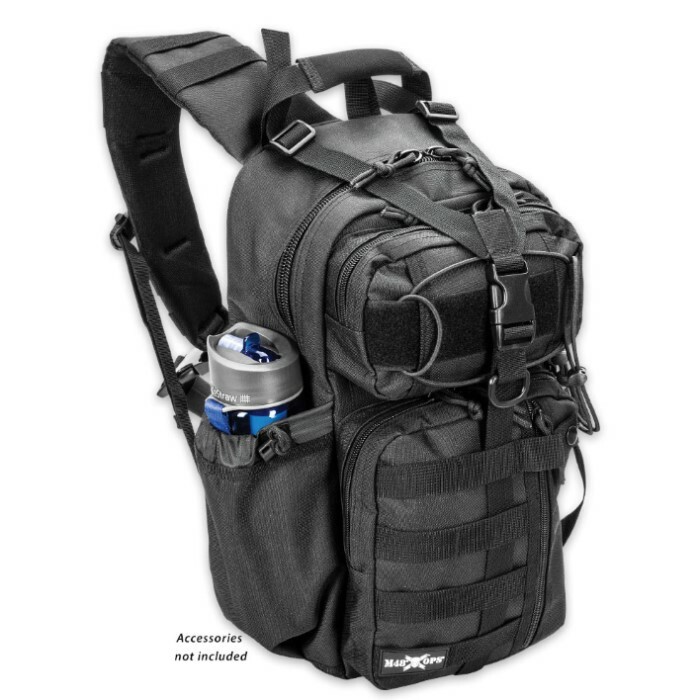 The great all-purpose pack also features a camel back and a side pocket that will fit a standard water bottle, plus, webbing that continues on one side.